"[Chicago's] political donor class is disproportionately and overwhelmingly made up of rich, white men with a penchant for austerity and budget cuts, according to the first-ever municipal-level study of race, class and gender disparities in buying elections," Sarah Lazare writes for AlterNet. "Sean McElwee of the public policy organization Demos found that, during the 2015 mayoral race, candidates received 'more than 92% of their funds from donors giving $1,000 or more.' A stunning 88 percent of these big donors were white, in a city where white people comprise just 39 percent of the population. It is worth noting that big donors to the widely-reviled Rahm Emanuel skewed very white - at 94 percent. This compares with 61 percent for his unsuccessful rival Chuy Garcia. "Not shockingly, big donors are far richer than the average city resident. 'Though only 15% of Chicagoans make more than $100,000, 63% of donors did and 74% of those giving more than $1,000 did,' McElwee notes." Shouldn't a poor black person - or any black person, given the city's demographics - have the same say on city policy as a rich white person? This is a huge problem for democracy. Shouldn't I have the same say as, say, Michael Sacks? He got rich running a hedge fund; I got poor doing journalism. Which one of us has a deeper understanding of the issues? "These disparities extend far beyond the mayoral race. 'Only five overwhelmingly white wards accounted for 13 percent of Chicago's population,' the study finds, 'but 42 percent of donors to the Chicago mayoral and aldermanic races.'" Democracy in Chicago is clearly askew. Here, however, is the real catch. Surveys show that the political goals of wealthy Chicago residents diverge dramatically from those of the broader population. The 2012 Chicago-based Survey of Economically Successful Americans found that the city's wealthy residents, two-thirds of whom are political donors, were far less likely to support a higher minimum wage or "decent standard of living for the unemployed." They were also far less likely to agree with the statements that the federal government "should spend whatever is necessary to ensure that all children have really good public schools they could go to" and make sure "everyone who wants to go to college can do so." Meanwhile, separate data from the Cooperative Congressional Election Studies shows that Chicago's donors are far more likely than their non-donating counterparts to back national austerity measures to reduce the debt. "The current path Chicago is following, with cuts to mental health services, infrastructure and public schools, is responsive to the preferences of the donor class, not average Chicagoans," writes McElwee. That last claim is reminiscent of the findings of Gilens and Page, whose research shows that "the preferences of rich people had a much bigger impact on subsequent policy decisions than the views of middle-income and poor Americans. Indeed, the opinions of lower-income groups, and the interest groups that represent them, appear to have little or no independent impact on policy." Conclusion: In no objective way can Rahm Emanuel claim to represent "Chicagoans." He does not enact policy on "their" or "our" behalf. I realize this isn't news to a great many of you, but the extent of it (and the academic proof thereof) is still of great significance. But is anyone "important" listening? 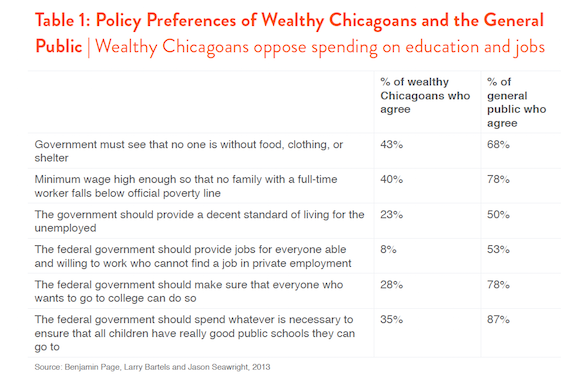 McElwee wrote up his work for himself on Salon, where you can see, for example, Table 1: Policy Preferences of Wealthy Chicagoans and the General Public. Research proposal: Overlay the data with a content analysis of Chicago media coverage - is it similarly skewed toward the interests of the wealthy (and their policy preferences)? I think we already know the answer to that, but documenting it would be fascinating. The success of The Plan has another helpful subplot playing out. The public is breaking out in hives. Don't stop eating now, boys. Any young flower can be arresting. Featuring: Municipal Waste, Los Straitjackets, Deicide, Dream Theater, White Denim, Can I Get An Amen, Behemoth!, Sam Cohen, and Klaus Johann Grobe. Jim "Coach" Coffman is away this week on a super-secret mission. He'll return next Monday. 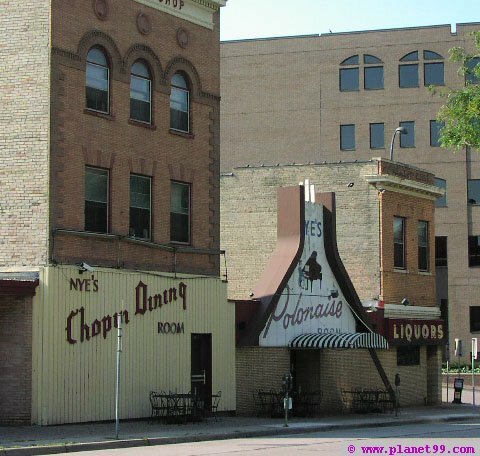 How Cities Are Protecting Small Neighborhood Shops. This is a fantastic - and astonishing - read. Nobody refuses to comment more in this town than our newspaper editors. The Beachwood Tip Line: Comment is free.